Minerals, as the inorganic solids that comprise the rocks, sediments and soils of the Earth, are an essential part of our environment. So, in a sense, all mineralogy is environmental mineralogy. However, the term environmental has come to be employed (particularly in combination with terms such as science, issue or problem) to refer to those systems at or near the surface of the Earth where the geosphere comes into contact with the hydrosphere, atmosphere and biosphere. This is, of course, the "environment" upon which the human race depends for survival, and which can be subject to disruptions due to human activity, particularly activity associated with the exploitation and utilisation of Earth's resources. This is the sense in which we use the term environmental in this book. Thus, we consider here those systems containing minerals that constitute the most important or key environments: soils, modern sediments, atmospheric aerosols, and the interior or exterior parts of certain micro- and macroorganisms. Both pure systems and those contaminated as a result of human activity are considered. We also focus on certain specific problems that arise from resource exploitation or utilisation and that involve minerals in some way; either, or both, in creating the problem or ameliorating it. These include problems associated with the waste generated by mining, particularly mining of metals, industrial and domestic wastes, and those wastes produced by the nuclear industry. Particular problems can arise from use of minerals and rocks in buildings and monuments and other cultural artefacts. The relationship between minerals and human health constitutes a special case where the environment includes the human body itself. Environmental mineralogy is a new field. As such it has no definite boundaries nor any established and accepted body of literature. Indeed, it is hoped that the present volume will help to define the nature and scope of this new field. Although there may be no wellestablished literature, there are books, monographs and journal articles that are already part of this new field. 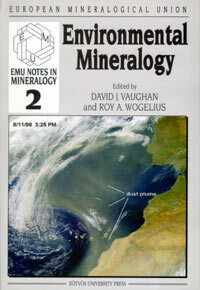 In the Appendix to this first chapter are listed just some of the key texts of relevance to environmental mineralogy, and some of the most relevant journals that constitute the emerging literature of environmental mineralogy. The objectives of this volume are to help to define the emerging subject of environmental mineralogy, and to provide an initial source of information both for mineralogists and other scientists who wish to understand or work in this field. It is hoped that it might also provide a text for use by those teaching courses in the subject at advanced undergraduate or graduate student level. In no sense is this volume intended to be comprehensive; that would be impossible, given the constraints involved. However, it is intended to point the way for those who wish to pursue scholarship and research in the field. Following this brief introductory chapter, we begin with a review of the analytical, experimental and computational methods that are of importance in environmental mineralogy (R.A. Wogelius and DJ. Vaughan). These include long established techniques used to characterise minerals and mineral associations, and the newer methods that can be used to study very fine particle solids, mineral surfaces, and interactions between mineral surfaces and fluids. Examples are given of analytical, experimental and computational approaches applied to important mineral systems. There follows a major section addressing what we term "key environmental systems". Firstly, soils are reviewed by J.D. Cotter-Howells and E. Paterson in regard to mineralogical aspects of soil formation and anthropogenic impacts on soils. Then the mineralogy of modem sediments is discussed by A.C. Aplin, including the processes of sediment formation and modification both through natural mechanisms and those associated with pollutants. Microbial interactions with minerals are discussed by J.F. Banfield and S.A. Welch, and the mineralogy of atmospheric aerosol particles considered by M. Posfai and A. Molnar. The five other major chapters are each devoted to discussing a specific environmental problem in the context of the relevant mineralogy. These are: metalliferous and related minewastes (J.L. Jambor, D.W. Blowes and C.J. Ptacek); industrial and domestic waste disposal and containment (R. Hermanns Stengele and M. Plotze); nuclear waste (C.D. Curtis); the buildings and monuments that constitute our collective cultural heritage (G. Chiari), and the particular relationship between minerals and human health (H.C.W. Skinner). As noted above, this volume cannot possibly be comprehensive. Rather, we aim to help in defining and advancing the field by using carefully selected examples. Mineralogy (and therefore mineralogists) are important to environmental sciencethe techniques of mineralogy, which are aimed at characterising key natural solid materials, their relationships and interactions both with each other and with fluids and gases, offer unique insights into very important parts of our environment. The corollary is also true. Mineralogists need environmental science as some of their more traditional areas of study and research decline in importance. The molecular scale understanding that is at the core of modem mineralogy is vital to the advancement of environmental mineralogy and hence environmental science. In this sense, environmental mineralogy is part of the larger field becoming known as molecular environmental science. It will only be through such fundamental understanding that we will be able to model and predict the behaviour of environmental systems containing minerals. The interlinking study of examples of natural systems with carefully chosen model laboratory systems, and with computer modelling from molecular to macroscopic scales, will be the key to advances in the field. Environmental mineralogy is one of the most exciting, rapidly developing, socially and economically relevant areas of study and research in modern science. It is hoped that this volume will further encourage developments in this field. i-xii + 434 pages. ISBN 963 463 1333.